A young Syrian refugee has been hospitalized after setting himself on fire at the Moria camp on the Greek island of Lesbos. He was protesting after his asylum application was rejected for the second time. A 26-year-old Syrian refugee is in hosptial after he set himself on fire at the Moria migrant camp on the Greek island of Lesbos. His application for asylum had been rejected for a second time. According to hospital sources, the man, who doused his jacket in petrol before setting fire to it, was treated for minor burn injuries to various parts of his body at the local hospital. His life is not in danger. The incident took place outside the asylum office at the Moria camp on Thursday afternoon, just moments after Greece's Migration Policy Minister Dimitris Vitsas had left the facility following a state visit. It marks another sad day for the controversial migrant camp, which is massively overcrowded.There are around 5,000 refugees and migrants at Moria and another smaller camp on the island, compared to an official maximum capacity of 3,000. Many have been stranded there for months in abysmal living conditions while waiting for their asylum applications to be processed. Last week tension rose at Moria following a riot that saw eight police officers injured in clashes with around 150 migrants. In the last few days several asylum seekers have threatened to commit suicide. One man is still being treated for injuries after being electrocuted and falling from a power pole. Earlier this month Amnesty International called on the Greek government to take urgent direct action as overcrowding, poor sanitation and security lapses are putting refugees' and migrants' lives at risk in all the North East Aegean camps. Over 60,000 refugees and migrants, mostly from Syria, Iraq and Afghanistan, have been stuck in Greece for more than 12 months after border shutdowns across the Balkan region stopped their planned onward journeys. In related developments, on the occasion of the second anniversary of the EU-Turkey agreement on refugees on March 18, Human Rights Watch (HRW) called on the Greek government to finally put an end to its so called "containment" policy and stop the suffering of thousands of people still stranded in overcrowded migrant camps. It is two years since the EU-Turkey "statement" committed Ankara to accepting the return of all asylum seekers who reached the Greek Islands via Turkey in exchange for billions of euros from the EU in aid and other benefits, and the resettlement of an equal number of Syrians already in Turkey. However, despite the agreement there are still over 13,000 people stuck in massively overcrowded refugee camps on the north eastern Aegean islands of Chios, Lesvos and Samos, where living conditions have been constantly criticized by human rights groups. 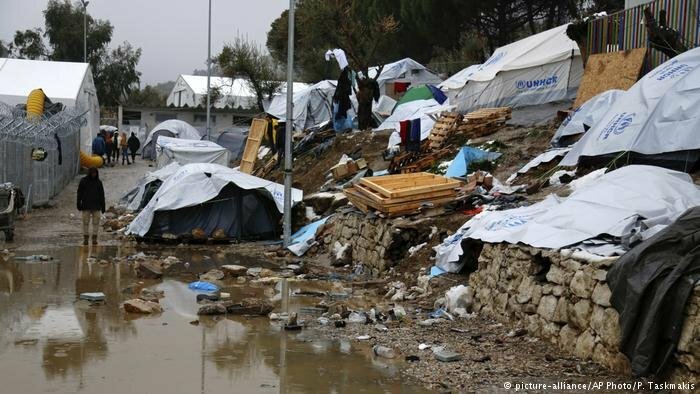 "Thousands of asylum seekers are trapped in crowded and filthy processing centers on the Greek Islands, with many spending the winter in lightweight tents or even sleeping outside on the ground," said a statement from HRW.